No, this isn't a joke. It was published on April 2nd and it's from Breitbart. 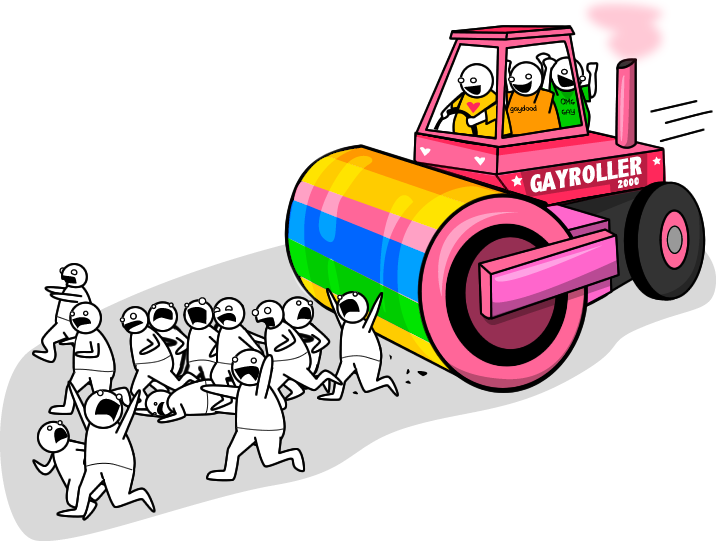 Somebody please draw the Big Gay Hate Machine. I know the Indiana "Freedom From Gay People" law is terrible, but on the upside, it's making all the homophobes come out of the woodwork for premium mocking. And it's destroying all Republican credibility. If there was any chance that they were going to win in 2016, it's gone now. Oh, lol, I love the Oatmeal. And that tweet is gold. I'll never understand the "Gay Agenda". Was talking to a guy the other day and said something about gay agenda and tin foil hats and he said "THE GAY AGENDA IS REAL! They're trying to take people's religious rights and there's a gay mafia in California that targets straight people!" Sounds like a keeper. Did you ask him if the gay mafia kills people or just turns them gay?